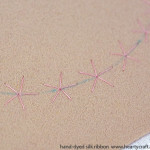 Today I’m posting a simple tutorial for a pattern that consists of just one stitch — spider web rose. It’s an easy one and does not require much prior experience in silk ribbon embroidery, but it rewards you with amazing results. The project itself is a perfect match for a weekend ahead, and it does not take long at all to finish it. 4mm wide silk ribbon. 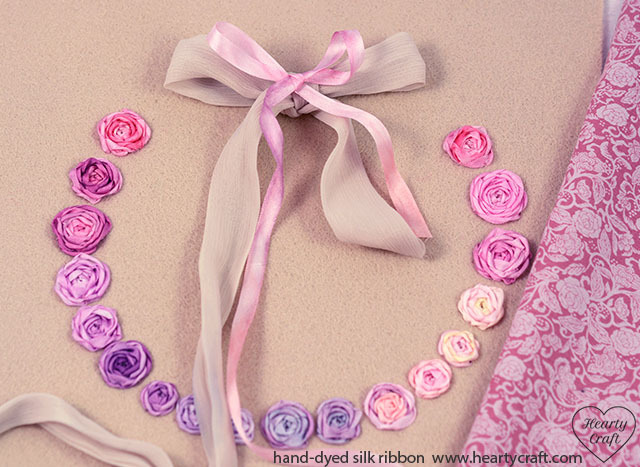 Using hand dyed silk ribbon you can get far superior results compared to plain-coloured one as colour irregularities and a variegated shade would give distinct life-like appearance to the roses. I used nine different shades just to show the look of different shades of ribbon that we stock, but you can use any number of shades of ribbon. Sewing or embroidery floss of the same shade as ribbon. I used pink one for all roses. A 3mm thick piece of felt to stitch on. Craft felt is a perfect choice, as it is inexpensive and easy to get in almost any craft store. A piece of cotton fabric the same size as the felt or bigger. Calico is perfect (as far as I know it is called muslin in US). Chenille (size 18), embroidery (size 8 or 9), and tapestry (any size) needles. 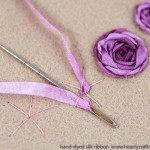 Please keep the tutorial on how to stitch spider web’s roses handy as you will be stitching a number of roses. It’s worth going through it at least once to get familiar with the technique. The step-by-step instructions are given below. You can click on the images to see larger versions. 1. 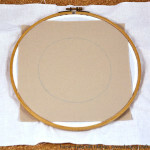 Using a water-soluble pen and an inner ring of a small embroidery hoop draw a circle on a piece felt. 2. 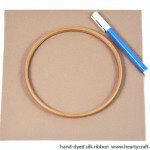 Place the felt over a piece of calico and mount both of them in a large hoop. The hoop should be large enough to accommodate the whole ribbon embroidery. My piece of felt is too small for that hoop, but with the large piece of calico I managed to mount it anyway. Even if you’ve got a sufficiently large piece of felt, use cotton fabric to support it anyway. The felt is easy to deform, and the fabric beneath it helps to keep the shape. 3. Using an embroidery needle and floss stitch five spokes for each ribbon rose. Stitch them over the circle line to create a crescent shape (see an image of the finished stitching below). As soon as you finish stitching spokes spray your piece to remove the water-soluble ink. Live you piece in the hoop while it dries out. You can speed up the drying process using a hair drier. 4. 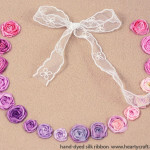 Stitch roses using silk ribbon. 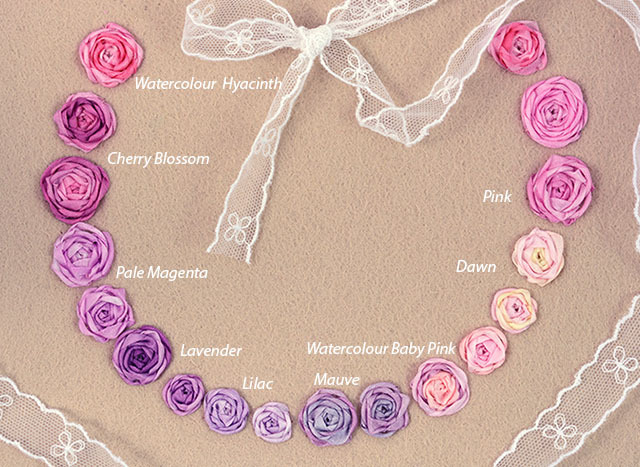 You can use just one ribbon shade for all roses or make a rainbow as I did. If you don’t have a tapestry needle for weaving, use a chenille one instead, passing it with the the blunt end under and over the spokes. 5. Make a bow using wider ribbon and attach it to the felt with sewing floss. Below, I put down various shades of ribbon from our range of hand-dyed silk ribbon, so you can get an idea what they look like on the finished piece. If you like our posts, why not to sign up for our fortnight newsletter to keep up with the news, tutorials, and patterns for ribbon embroidery? To sign up, just type in your email address into the form on the shop front page. This entry was posted in Blog Posts and tagged Free Patterns, Roses, Silk ribbon embroidery, Tutorial on 15th July 2014 by Zinaida.